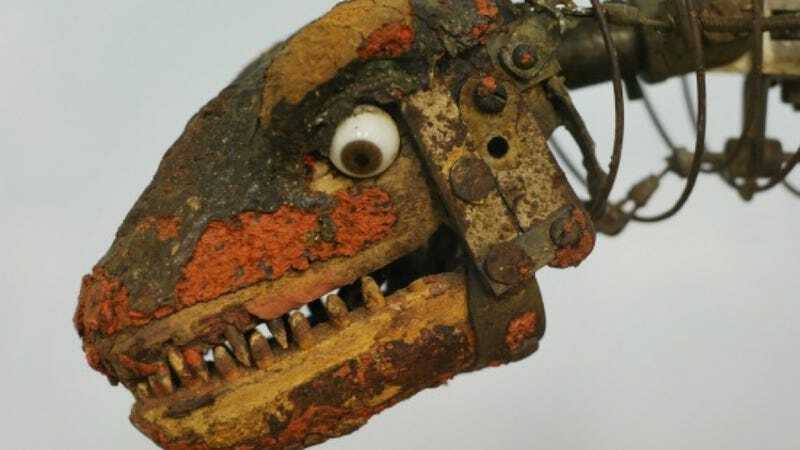 Over on Dinosaur Tracking, Brian Switek has posted this most excellent photograph of the robo-zombified head of the Brontosaurus model from the original, 1933 King Kong. The mock-up now resides at The Dinosaur Museum in Blanding, Utah. Call us crazy, but we think this model looks even cooler in its decomposed state than it did in mint condition almost 80 years ago. Can you imagine a movie where the headlining monster is a carnivorous sauropod, held together by festering flesh and rusty machinery, that terrorizes the land as it squeaks around on its comically tiny robo-wheels? We'd watch the hell out of that.